Difficult problems attract a host of different possible solutions – many of them turn out to be terrible, some are bit better, a few may be really good, and occasionally the process of creativity will produce something superb. But whether the goal is to create a molecule of carbon, an efficient shell shape, or a complex work of art, there is a deep structure to the process by which the best solutions to these problems are reached. 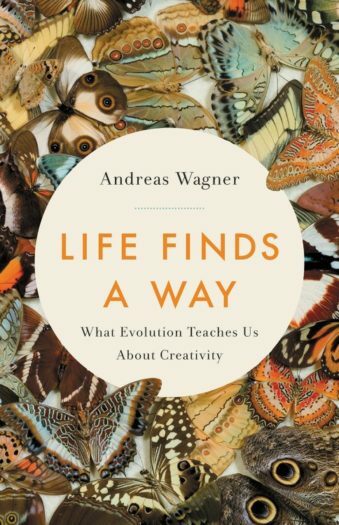 As Andreas Wagner explains in his new book, Life Finds a Way: What Evolution Teaches Us About Creativity, we can learn a lot by thinking of the process in visual terms, as if the array of possible solutions formed a rugged mountain landscape. Poor solutions are resigned to low foothills, and the best solutions form the highest peaks. Understanding how paths to the evolutionary peaks are charted offers surprising insights into creative processes from chemistry to culture. These maps, which have been known to biologists since the early part of the 20 th century, are called adaptive landscapes. But while they have been widely applied in biology, they are now proving to be very applicable to other areas as algorithms have become more powerful. In Life Finds a Way, Andreas draws on his own research and the work of many other scientists to explain the universal principles of creative achievement that unify all of nature, from the beginnings of the universe to today’s human world. These principles are so fundamental that they apply wherever creation takes place and the implications are far-reaching for education, business, and society. A thoughtful search for parallels between biological and human innovation… Wagner makes an ingenious case.